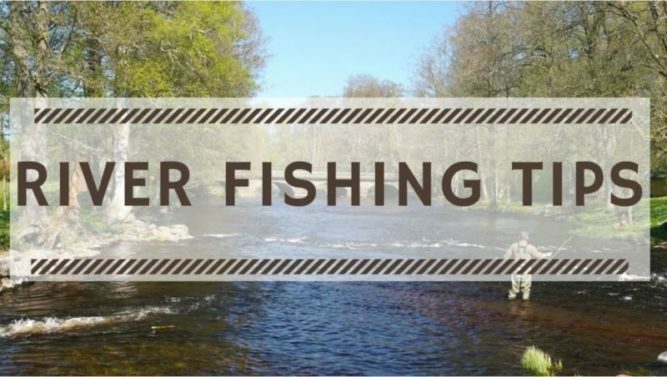 River Fishing Tips: Welcome to our River Fishing 101 tutorial. If you are a beginner, you can use this tutorial to learn How to Catch Fish in a River. If you have some experience with river fishing, then also you will find some advanced river fishing tips and tactics. Experts say that fishing in a river is easier than any other body of water. But sometimes it can be a little tricky if the water is flowing fast. To make the most of your river fishing trip, you need to learn some river fishing tips and tactics. Where to Fish on a River? There are many different types of fishing rods out there. We recommend an easy to use and versatile fishing pole for beginners. The first thing you should look in a pole is its sturdiness. I prefer the pole made of fiberglass or graphite. The next thing that is important is the length of the pole. The typical length, which works most of the time, is around 8 feet. Rivers have a variety of fish in them like trout, bass, carp etc. I think we all know that these fish eat different small creatures. Bait is a living creature, but it can be frozen also if that’s what you require, used to lure the fish you want to catch to your line. A very common type of bait is bloodworms, but you should be careful while handling them as they can bite your finger. Choosing the right bait is dependent on the kind of fish you want to catch. Polarized glasses can be very helpful for viewing and identifying targets. They will let you see the river and facilitate you to locate where fish are moving. It is as important to select your location as it is to get the right gear. If you go to a well-stocked part, chances of catching fish will increase. That is quietly understandable, but the question is how to find the right spot? Well, ask about the legal fishing options available from the local fish and game agencies. They will also tell you the limit and variety of fish that is available. Also, it is advisable to ask them if you can keep the fish you will catch. You might find it surprising, but there are places where you can only catch and release the fish back into the river. Choose the spot wisely by observing the outlook of the river. It is better to choose the curve or bends in the river as your fishing spot because the water flows faster and brings the food that the fish eat to the much-curved edges. Also, the place where faster and slower moving water blend together brings more food for the fish and ultimately the fish. Furthermore, the places where there are weeds tend to have more fish and can be good spots for fishing. It is also easier to fish in the calmer river, as fish can smell the bait better, but if you cannot find a calm river than choose the river or the part of the river which has slow-moving currents. The river might fall into someone’s land and you should make sure that you have the proper permission from the owner or any authority that is responsible to give the permission. Selecting the time for fishing is as important as the place. Chilly weather can be difficult for any outdoor activities including fishing. But from the fish point of view, they love cold wet season. So, if you can, choose a rainy day to go fishing as the fish will be active and chances of your getting lucky will be increased. But don’t forget to carry a lightweight rain suit on your fishing day out. Other than that, the ideal time for fishing is the beginning of the day. It is dawn when the fish are most active before the sunrise: they don’t seem very fond of light. First, you need to bait your hook, which can be difficult if you are squeamish, but once you get the hang of it you will find it easy. Live bait is more responsive, so using it will get you better results. Live bait has a stronger odor and that is why it attracts more fish. It works even better if you bounce the bait along with the current. After that, you attach a “sinker” to your line, so that bait can be kept to the river floor. This will protect your bait from flowing away with the current. I suggest beginners to go for a copolymer fishing line. Now hold the rod strongly and swing it back over your head and throw the line in the river. Make sure that you hold the rod tightly, otherwise, you might lose the pole to the currents of the river. The fish won’t come running to your bait immediately, but wouldn’t it be wonderful if they did? Anyways, the point is that you may have to wait for hours before you might get a fish in your hook. But holding the rod all the time is tiring and pointless. So, you can rest it on a rock or a stick or any support you can find. When the fish bites your bait, the fishing rod gives a jerk or several jerks as the fish is trying to get away. If you are not holding the rod then you won’t be able to know when the fish bites. That is why it is advised that you either add a small bell hanging on the rod or you can rest your rod against a tin can, so it makes noise when moved. When you feel the jerk or pull of the fish biting the bait, then you should be quick to hold your fishing pole strongly and pull. But if you pull in a wrong direction, you might lose the fish. As they say, practice makes you perfect, so you will learn how to pull with time. I would advise you not to pull the rod toward you as the fish might slam into you. Just pull upward in the air, and when the fish gets out of the water, let it fall to the ground. The fish will flap itself to try to get back in the water, so you need to hold it to the ground. When it becomes motionless, take the hook out carefully. Now the fish is yours, cut it clean and cook it to enjoy your effort. If you were doing it just for fun and don’t intend to eat the fish, then let it go in the water again. But if you plan to release it, then don’t wait for it to get motionless. Quickly and carefully remove the hook and release the fish back into the water. There are certain fish which are native to certain areas and you should be aware of that. If you are planning to fish in a certain area, then you should know which kind of fish you will be dealing with. This helps a lot in the selection of the bait. For example, the right bait for largemouth bass is different than the right bait for trout. If you know your target, you can choose which kind of bait you need. You can use both live bait and plastic one. Live bait works wonders for crawfish and minnow or plastic bait for smallmouth bass. You would enjoy fishing if you take it as a hobby. It is an activity to relax and enjoy a holiday with friends. As it is for those who have the time and patience to wait for hours, you should have the time at your disposal. You cannot go fishing in a river for commercial purposes. The reason is that, mostly, the authorities don’t let you do that and secondly a single rod and person cannot achieve the purpose. For that oceans and seas are more appropriate with a proper workforce, equipment, and transport. You don’t have to purchase the equipment every time you plan to go fishing. There are clubs and activity centers where they not only teach you river fishing techniques but also lend you boats and equipment. You just pay the rent and return the equipment and boat after you are done with fishing. If you do fishing regularly, you will be an expert in applying the techniques. You will be handling the pole with confidence. This will get you better results. But if you are a one-timer, or doing it occasionally, then you will need guidance about small tricks that can help you out. For example, bottom bouncing technique: if you do that along the current, you can get the fish around the ledges and deeper cuts around the river. Another tip is to cast spinners upstream so that fish going downstream for food can be caught. You can also use fishing jigs in the areas of slow currents especially near the mouth of the river. Safety should always be the first thing that you consider before doing any activity, fishing including. If you are sure that all the safety measures are taken, you would enjoy the fishing more, since your mind will be at ease. First thing is that you should know how to swim. If you don’t know how to swim, then you should fish wearing a personal flotation device such as an inflatable life vest. If you want to wade in the water, make sure you know how deep it is. Also, before going into the water, wear fishing waders and a wader belt in case you fall. Make sure you read and follow all the local regulations regarding security before planning on fishing. Whether you need a fishing license or not depends upon the local laws where you plan to fish. In some places, you might not need a license, while in others you might need one. E.g. in Virginia, any resident under 16 years of age does not require a license for trout fishing. Most states have some kind of exemptions for a license for its residents. But the convenient part is that now you can apply for the fishing license online for most of the places, provided you have the required documentation. But even with lenient license rules, the basic requirement for most of the places is that you would need to complete a basic fishing course. Conclusion: How to Catch Fish in a River. River Fishing Tips & Tactics. I think I have tried my best to help you learn how to go about fishing in the river. With proper information about the gear, river fishing tips, and techniques, you can enjoy river fishing to the fullest. You can catch fish for your meal and enjoy a complete outdoor activity-filled day by barbecuing the fish as well. Make sure you choose a suitable day and time. Don’t forget to carry suitable river fishing baits according to the fish you plan to catch. Also, knowing your river is a smart thing to do. Otherwise, you might end up buying bait for the fish that is non-existent in the river. Moreover, be sure that you are allowed to keep your spoils when you leave. Be fully informed about everything, so there are no surprises out there to spoil your fun. I hope you liked the river fishing tips, river fishing tactics and the river fishing techniques that I shared with you. I hope I answered most, if not all of your queries regarding river fishing. If you want to add anything or share your experience, please comment underneath. Also, if you found this article of useful, share it with your friends.